MooMama: Last Minute Gift Idea for End of School! Last Minute Gift Idea for End of School! 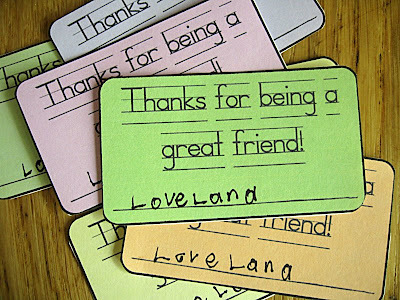 Amidst the bustle of end of school plays, cleaning of desks and backpacks, vacation planning or stay-cation scheduling, and remembering the teachers with special cards or gifts, we sometimes forget the friends that our children spent their entire year of school with! They made friendships, played games, studied with, sang and danced, competed against, laughed and cried with these boys and girls! I wanted to have a little something that my girls' could bring in for the last day of school to give to their classmates! I made colorful business-card sized tags and had them write their name on the bottom line. I think attaching them to a small bottle of bubbles or a little box of homemade cookies makes for a perfect inexpensive gift for the last day of school! These cards can be used as calling cards also! Just add the child's name & phone number on the bottom line as an instant K.I.T. card to give to their friends! Here is the *link* to these free printable calling card tags! Happy summer days ahead! *I had a request to make these card in French! If you are interested, click *HERE* for this version! Enjoy! Very cute! Too late for us to do this - my kids will be missing the last days of school due to our vacation. So tomorrow is our last day, but the rest of the school goes until Wednesday. Mentally filing this for next year! What a great idea! I so wish I'd seen this before my daughter's last day of school. Such a sweet thing. And thanks for pointing me over to kindovermatter via your side bar. It's such a nice place to land. i LOVE this idea. i'll be posting about this for sure (w/link and credits.) sososo cute!